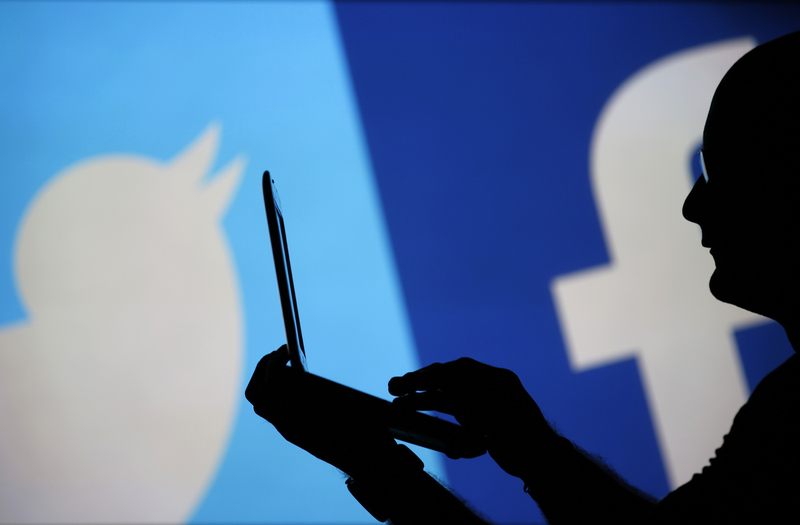 A man is silhouetted against a video screen with a Twitter and a Facebook logo as he poses with an Dell laptop in this photo illustration taken in the central Bosnian town of Zenica, August 14, 2013. Facebook will report second-quarter financial results on July 25. Revenue is expected to increase 43 percent year-over-year to $13 billion, according to Thomson Reuters data that compiles analysts’ average forecasts. Analysts also expect earnings of $5.1 billion, a 31 percent increase from a year earlier. Twitter will report second-quarter earnings on July 27. Analysts on average are expecting revenue to rise 21 percent year-over-year to $693 million, and earnings to more than double to $130 million.